Plant development is an umbrella term for a broad spectrum of processes that include: the formation of a complete embryo from a zygote ; seed germination; the elaboration of a mature vegetative plant from the embryo; the formation of flowers, fruits, and seeds; and many of the plant's responses to its environment. Plant development encompasses the growth and differentiation of cells, tissues, organs, and organ systems. Plant development shares many similarities with developmental processes in animals, but the fact that plants are nonmotile, photosynthetic organisms requires certain novel developmental processes in addition to the common ones. Embryo formation begins with cell division that establishes the apical-basal (top-bottom) axis. Further divisions elaborate on this basic plan, finally forming the cotyledons (seed leaves), as well as the apical meristems of root and shoot. spherical mass of cells, the globular-stage embryo. Second, differential growth within the globular embryo gives rise to the "heart" stage embryo, the earliest stage when the precursors of cotyledons , root, and stem can be recognized. This key embryogenic process is called organogenesis. Third, distinctive planes of cell divisions bring about histogenesis , the process by which cells within embryonic cotyledons, root, and stem acquire different shapes, forming the precursors of the plant tissue systems. Last, the apical meristems of the shoot and root systems are formed at the apical and basal ends of the embryo. After an embryo has reached full size, developmental changes continue to occur at the cellular level. Embryonic cells, particularly those of the cotyledons, begin to synthesize and store the proteins , lipids , and starch that will provide the energy and basic building blocks for germination and seedling growth. Next, the embryo begins to desiccate, sometimes losing up to 80 percent of its previous water content, and enters a phase of dormancy. Development and metabolism are arrested in dormant embryos, and seeds containing dormant embryos can survive for many years (sometimes centuries) and withstand extreme temperatures and drought. Plant hormones are important regulators of embryogenesis and seed dormancy. The hormones auxin, gibberellic acid, and cytokinin all stimulate growth and are present in the embryo during the stages of embryogenesis. As the embryo matures, these hormones are degraded and abscisic acid is synthesized by the embryo. Abscisic acid provides a developmental signal for the embryo to initiate the synthesis of storage compounds and to undergo desiccation . Abscisic acid is present in dormant seeds and is thought to play an important role in maintaining seed dormancy. The root is the first portion of the plant to emerge during germination. Growth of the stem behind the cotyledons forms a "hook" that emerges from the soil, followed by emergence of the cotyledons, which begin to photosynthesize to feed further growth. order to germinate. Other species require low levels of light in order to germinate. Once germination is initiated, the embryo follows a typical pattern of development. In many plants, the preformed embryonic root elongates first, forcing its way out of the seed coat and into the soil. Next, the embryonic stem, usually the part below the attachment of the cotyledons (the hypocotyl), elongates. Once the hypocotyl has carried the cotyledons into the light, they expand, providing a broad surface for photosynthesis. Environmental factors and their translation into hormonal signals are important for seedling development. For instance, germination in the dark results in developmental events that help the seedling push its way through the soil into the light. The hypocotyl elongates quickly and maintains a "hook" near its tip that protects the cotyledons and shoot apical meristem region. 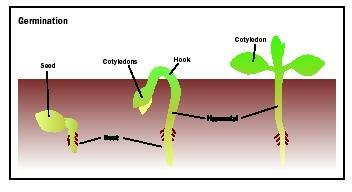 Cotyledon expansion is suppressed so that they are not damaged as they are pulled through the soil. In contrast, if the same seeds germinate in the light, the hypocotyl hardly elongates at all and does not form a hook, while the cotyledons quickly expand. The hormone gibberellic acid plays an important role in seed germination and early seedling growth. Gibberellic acid induces the synthesis of enzymes required for the metabolism of stored foods, thus providing energy for seedling growth. Gibberellic acid also induces cell division and cell expansion in dark-grown hypocotyls, maintaining their rapid growth through the soil. The early stages of germination simply involve the enlargement of the root, hypocotyl, and cotyledons that were preformed in the embryo. 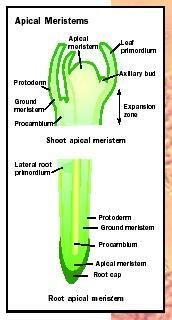 Postembryonic development, however, is focused on the apical meristems. The shoot apical meristem is the source of all the leaves, stems, and their component cells formed during the lifetime of the plant. 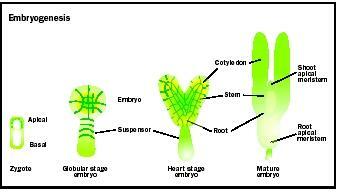 The meristem itself is composed of a small population of perpetually embryonic (meristematic) cells. These cells grow and divide, giving rise to new cells, but never mature themselves. Thus there is always a source of new cells at the tip of the shoot. The root tip has a similar population of meristematic cells that gives rise to all root tissues. Both of these meristems are characterized by an indeterminate growth pattern: one that is not finite, but, in theory at least, could continue throughout the lifetime of the plant. Apical meristems are involved in several distinct developmental processes. The meristems are the location of cell proliferation and thus the source of all new cells in the shoot and root systems. The regions below the meristems are the sites of active growth, as new shoot and root tissue rapidly expands. The shoot apical meristem plays a role in organogenesis, the formation of new leaves and axillary buds in a precise spatial pattern. In contrast, the root apical meristem is not involved in organogenesis; lateral roots are initiated by pericycle cells, which are themselves derived from the meristem, usually several centimeters away from the meristem. The apical meristems also play a role in histogenesis by giving rise to cells that undergo distinct patterns of differentiation to form the specialized tissue types of the shoot and root. While the embryo initially gives rise to the precursors of dermal, ground, and vascular tissues (protoderm, ground meristem, and procambium, respectively), these tissue precursors continue to be formed by the apical meristems and represent the first stages of cell and tissue differentiation. Structure of root and shoot apical meristems. Growth is defined as an irreversible increase in mass that is typically associated with an increase in volume. Plant cell growth is associated with meristems and must be carefully regulated in order for organogensis and histogenesis to occur in the appropriate patterns. The plant regulates growth by regulating the extensibility of its cell walls. A cell that has nonextensible cells walls can take up some water, but eventually the physical pressure of the water inside the cell pressing out on the cell wall (the turgor pressure) prevents the entry of additional water and any further change in volume. In contrast, a cell that has extensible cell walls can take up a substantial volume of water and thus increase in size. Turgor pressure that would otherwise prevent water entry momentarily decreases because the walls keep stretching. Typically cell growth occurs in small increments: (1) wall extensibility increases, reducing turgor pressure; (2) reduced turgor pressure allows water to enter the cell, increasing cell volume; (3) wall extensibility decreases, allowing the cell to build up turgor and preventing further water entry; and (4) the cell undergoes a cycle of synthesis of cytoplasmic and wall components, adding to the cell's mass. This cycle of incremental growth is repeated many times until the cell reaches its final size. The hormones auxin and gibberellin each promote cell expansion by loosening the bonds between adjacent cell wall molecules. Each hormone acts on a different molecular target. 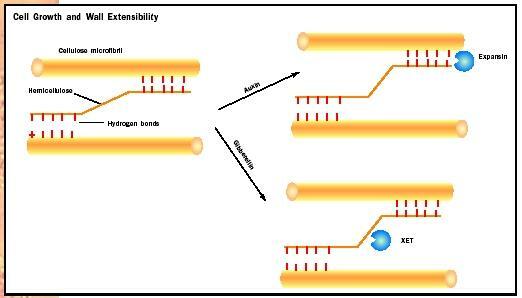 hemicellulose molecules also allows the cellulose microfibrils to move farther apart, increasing wall extensibility. Cell division and cell growth are often tightly linked. When the rate of cell division is balanced by cell growth, as in the apical meristems, average cell size does not increase. As the meristem grows away from earlier formed cells, the ratio of growth to division increases, resulting in overall cell enlargement. As the tissues mature further, cell division ceases completely, giving rise to zones of pure cell enlargement where most of the visible growth of the plant occurs. This relationship between division and growth, coupled with observations of the predictable planes of cell division during histogenesis, indicates that cell division is carefully regulated during plant development. Molecules called cyclin-dependent kinases (CDKs) are key regulators of cell cycling (including cell division) in plants. CDKs are activated by association with a regulatory subunit called a cyclin and by phosphorylation and dephosphorylation events. The plant hormone cytokinin appears to regulate the cell cycle by interacting with the CDKs. Cytokinins enhance the synthesis of the cyclin subunits that are required for the cell to enter the deoxyribonucleic acid (DNA) synthesis phase of the cell cycle. Cytokinins also enhance the CDK dephosphorylation step that is required for the cell to progress into mitosis . Both of these processes are inhibited by the hormone abscisic acid; thus a "developmental tug-of-war" occurs between a division-enhancing hormone and a division-suppressing hormone. The delicate balance between them determines the rate of cell division and this type of interaction is probably typical of the hormonal regulation of many aspects of plant development. Differentiation is the process whereby cells, tissues, and organs become different from each other and from their precursors. The concept can be applied to organogenesis since cotyledons, foliage leaves, sepals , and petals may all develop from similar appearing precursors, the leaf primordia. As these organs mature, they become different from each other in size, shape, and the development of distinctive cell types. For instance, the epidermis tissue of petals is sharply differentiated from that of cotyledons, foliage leaves and sepals that are photosynthetic organs. Correlated with a photosynthetic function, the epidermis of these organs is made up of flat, transparent cells that allow the penetration of light into internal tissues. Specialized guard cells that allow CO 2 to enter the leaf are also present. In contrast, the epidermal cells of petals contain brightly colored carotenoid or anthocyanin pigments. These cells also have a papillate shape that imparts a velvetlike sheen to the petal surface. Since petals carry on minimal photosynthesis, they often lack guard cells. The process of differentiation is best understood on a cellular level. For instance, guard cells are highly specialized epidermal cells. Early in the development of a leaf, protodermal precursor cells undergo a distinctive pattern of cell divisions. At first the cell divisions are asymmetric, producing one large and one small derivative. 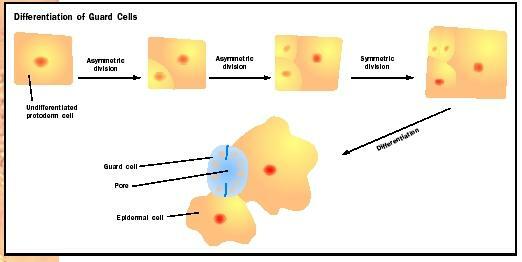 The large derivative stops dividing and differentiates as an unspecialized epidermal cell, while the small derivative undergoes another asymmetric division. At an unknown stop signal, the small derivative undergoes a symmetric division, giving rise to two equal sized cells that become the guard cells. Unlike their plain neighbors, these cells develop a distinctive kidney shape, unevenly thickened cell walls, large, conspicuous chloroplasts, and finally form a pore (the stomatal aperture) between them. • The formation and maintenance of the perpetually embryonic regions, the apical meristems. The meristems have an indeterminate growth pattern that result in the occurrence of growth, organogenesis, and histogenesis throughout the life of the plant. • Plant cells have rigid cell walls that prevent cell movement. Thus organogenesis and histogenesis must occur through differential growth and regulation of the planes of cell division. Cell-cell communication is important in plant development, but cell recognition is likely less important than it is in animals since plant cells keep the same neighbors throughout their life. • Plant cells are totipotent; that is, able to differentiate as a different cell type if given the appropriate stimulus. Totipotency is likely a reflection of the plant's sedentary lifestyle. Plants can't escape predators and other kinds of damage, but they can readily repair wounds and reconnect vascular strands by differentiating the appropriate cell types. Guard cells regulate passage of gasses into and out of the leaf through pores in the surface. Guard cells form by a series of cell divisions from undifferentiated protoderm, including a final symmetric division that forms the two identical cells. Raven, Peter H., Ray F. Evert, and Susan E. Eichhorn. Biology of Plants , 6th ed. New York: W. H. Freeman and Company, 1999. Steeves, Taylor A., and Ian M. Sussex. Patterns in Plant Development. New York: Cambridge University Press, 1989. Wolpert, Lewis. Principles of Development. New York: Oxford University Press, 1998.